Snrky: Is that why you're on your fourth team in six months? Is that why you're on your fourth team in six months? I don't think I realized how much cognitive bias played into the world of politics. Peruse this list and you can see that much of the political rhetoric and campaign tactics we as the electorate see in any given campaign season appear to be at worst directly manipulating them (see here and here), and at best using their existence to one's advantage. Given that the corporate world is equally full of politics one has to wonder whether exploiting cognitive biases in direct reports, peers, and supervisors is learned as one makes their way up the corporate ladder. Then again, even if it that is actually true, you just may not believe it. See how many biases you can spot in today's post. Title: Is that why you're on your fourth team in six months? 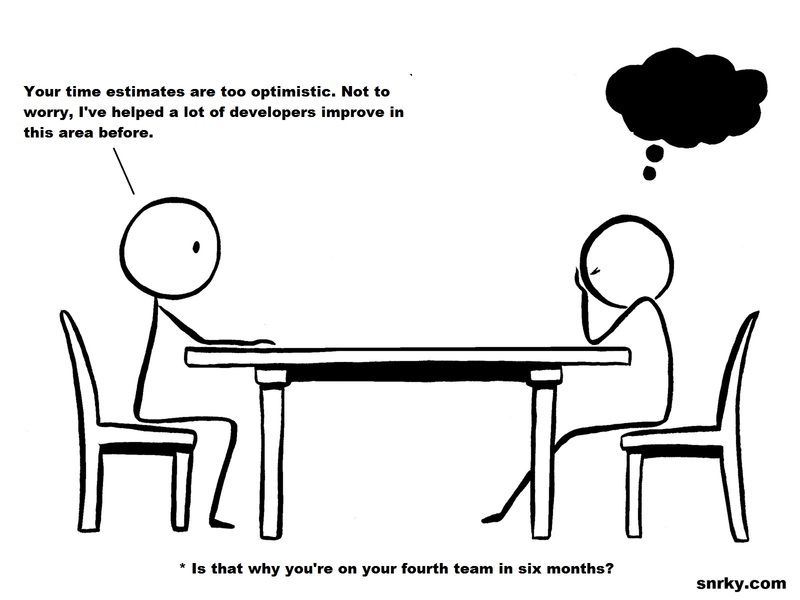 Snarky: Your time estimates are too optimistic. Not to worry, I've helped a lot of developers improve in this area before.